I made it through the first whole week back at work after my two-week hiatus. It was hard. It wasn’t fun, and I pretty much wanted to take a big fat nap under my desk every other hour. I could legitimately do this since my desk isn’t like a normal desk that goes straight across, it kind of curves and would fit my short body perfectly. I could probably even get a small shelf in there with a little nightlight and everything – George Costanza style. Being the good employee, I am, I refrained, and instead got up and went to the kitchen to stuff my face with snacks hoping to fight the back-to-work blues. Last week, I lived a life of leisure. It went a little something like this: Wake up at 9:30am. Drink coffee on our balcony overlooking all of PV and the ocean. Read. Go to breakfast on the beach. Lay out on the beach. Read. Come home, get ready. Drink a Mexican beer. Go to dinner. Read. Sleep. Do it all over again. Now, instead of gradually waking up by the rising sun, and the scent of coffee coming from the kitchen, I’m abruptly woken up by my internal alarm clock and the scent of Ravioli’s dog breath. Instead of walking out to a pristine ocean view and a comfortable 80 degrees, I’m now walking out to a snow-covered driveway and a bitter 20-something degrees. The more days that go by, the easier it gets to adjust back to real life. My body has slowly started to come to temperature, I’m finally used to getting up before 8am again, and I don’t crave a strong margarita come 5pm. I must be coming to terms with reality. One cannot live like a lazy beach bum day to day. I’ve told you a thousand times, but I have a very serious love for Mexican food, and I didn’t get sick of it once last week, not once. In fact, I’m having it again tomorrow, because I just can’t get enough. BUT the one food that I desperately craved in Mexico besides enchiladas, guacamole, tacos and fundito was a burger, and I would have satisfied my craving there, but I wasn’t too sold on a Mexican burger. Every time I saw a waiter on the beach coming from the kitchen with a burger, I followed it secretly with my eyes and would start to order it, then retreat. On the plane ride back, I immediately started my burger making plans. Since I just consumed a boat-load of food in the previous week, I decided to go with a bison burger to slightly lighten the dish up, and allow me to pile it high with all kinds of delicious toppings. If you haven’t had bison before, I recommend you give it a shot. I hesitantly tried it for the first time about five years ago, at a local gourmet burger shop, and fell head over heels, because honestly, I can’t really tell too much of a difference between it and regular lean ground beef. Keyword: LEAN. I can tell the difference between bison meat and an 80/20 ground beef mix, but I can also tell the difference between a lean ground beef and an 80/20 ratio also. 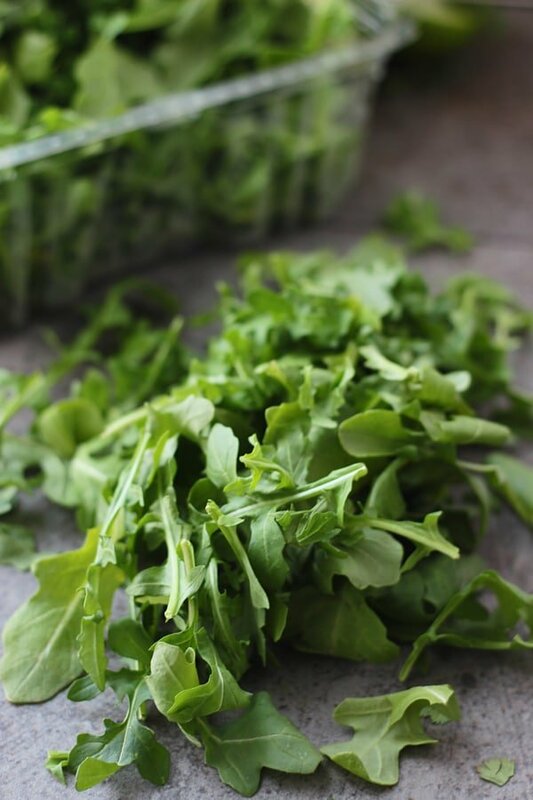 It’s not a bad difference, just a slightly less fattening taste – if that makes sense. It cooks up the same as ground beef, although I like it more on the medium-well side versus how I would normally order a burger, which is medium. I made the patties the same way I make any other lean ground beef or chicken burger: plenty of grated onion for added moisture, a little bit of garlic, worcestershire sauce and a generous amount of salt. You don’t want to alter the flavor of the meat too much, just enhance it and prevent the meat from drying out while cooking. Next up, the toppings, which in this case MAKE the burger. 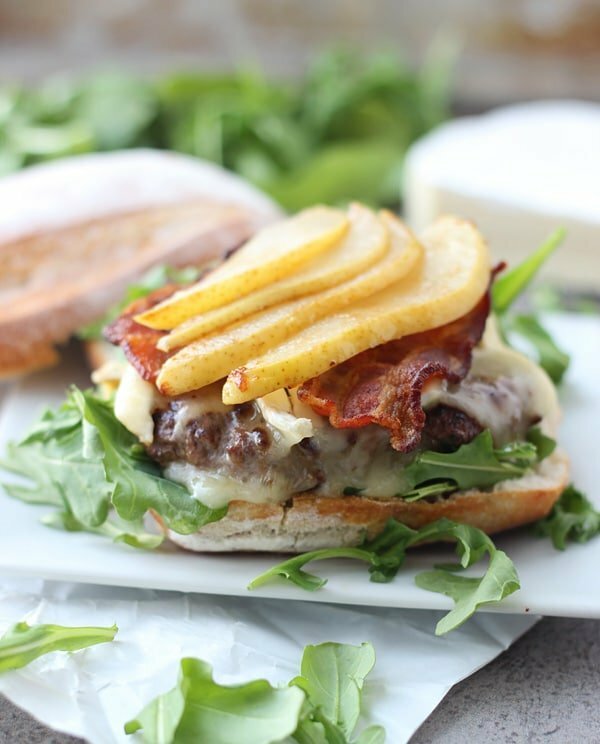 I’ve been thinking about this burger combo for a while now, since summer actually, but I thought it was more of a “winter” burger, maybe because I associate pears and brie with the colder months and holidays. Anyways, since then, I’ve kept it in my little recipe arsenal, just waiting for the perfect time to bring her out. The pears? Ohmygosh. So so good. I kept sneaking bites of them, and almost had to make more, but showed a smidge of restraint before they disappeared. First, I fried up the bacon, removed all of the grease except for about a teaspoon or so, then melted a tablespoon of butter into the pan, browned the butter and then threw in the sliced pears, a little bit of brown sugar, salt and crushed red pepper flakes. 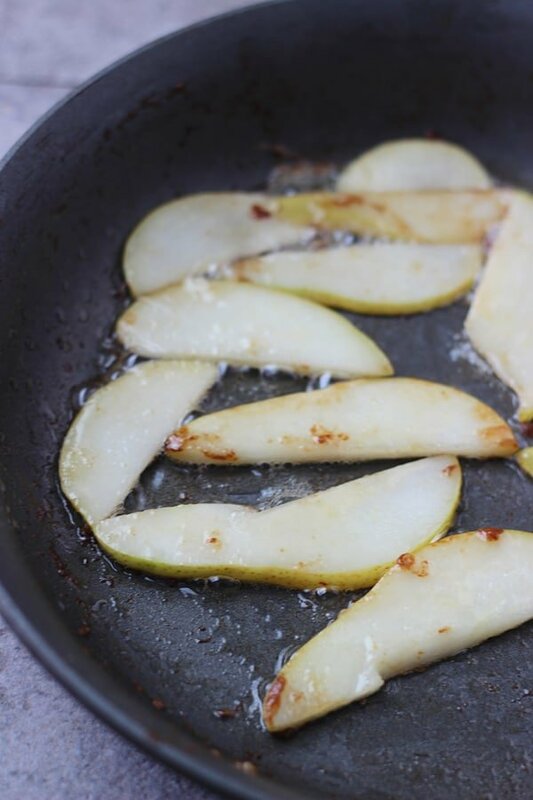 I cooked the pears until they were just softened, sticky, sweet and slightly spicy. When the burger was almost finished cooking, I piled the patties with lots of brie cheese, covered and waited for them to melt it into a gooey oblivion. Here’s a little trick I learned from Bobby Flay, before you cover the burgers, pour a couple tablespoons of water into the grill pan, it will help to melt the cheese quick, and give the burgers a little bit extra moisture. 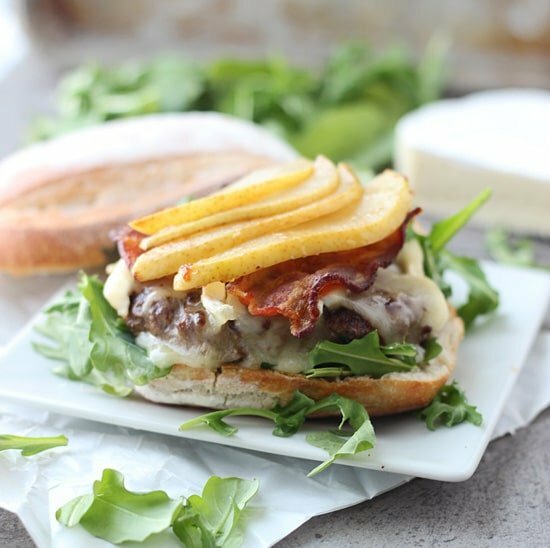 I then stacked the patties on a toasted bun covered in a little mayo and arugula, then topped them off with the bacon and caramelized pears. This is one serious burger. Juicy, cheesy, sweet, spicy, crunchy and totally fabulous. 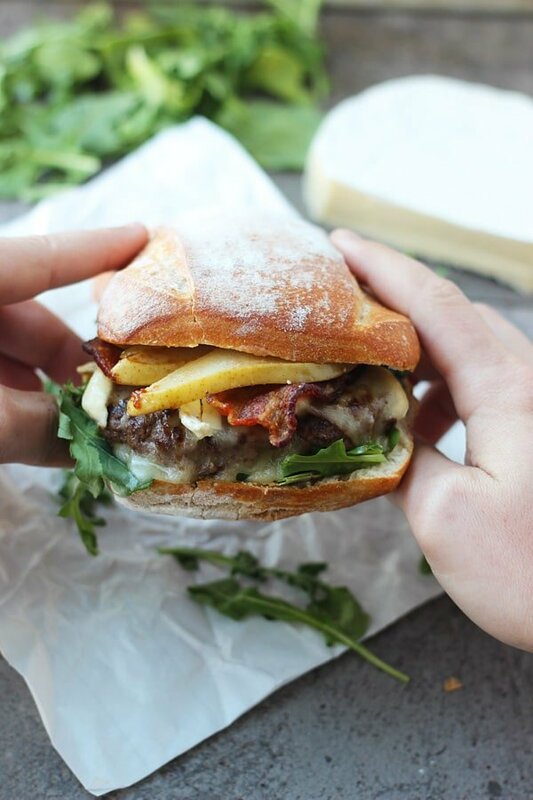 34 Responses to "Bison Burgers with Brie, Bacon and Caramelized Pears"
Incredible Nicole; this is so going onto our “have to make it soon recipe list”. Looks amazing. It’s so hard getting back into the swing of things after a long vacation. Congrats on making it through the first week!! These are gorgeous Nicole! My hubby would go nuts over these burgers! I totally could! Haha. Agreed. You can never ever ever go wrong with bacon! Oh wow, wow, wow! I read the title of the recipe expecting it to say caramelized ONIONS. But pears? oh my gosh, that sounds and looks ridiculously good. I love pairing fruits with savory foods. Love the tip about adding some water to the grill pan to melt the cheese and add moisture to the burgers. Going to have to remember to try that! This is definitely one serious burger! And it looks so amazingly good! 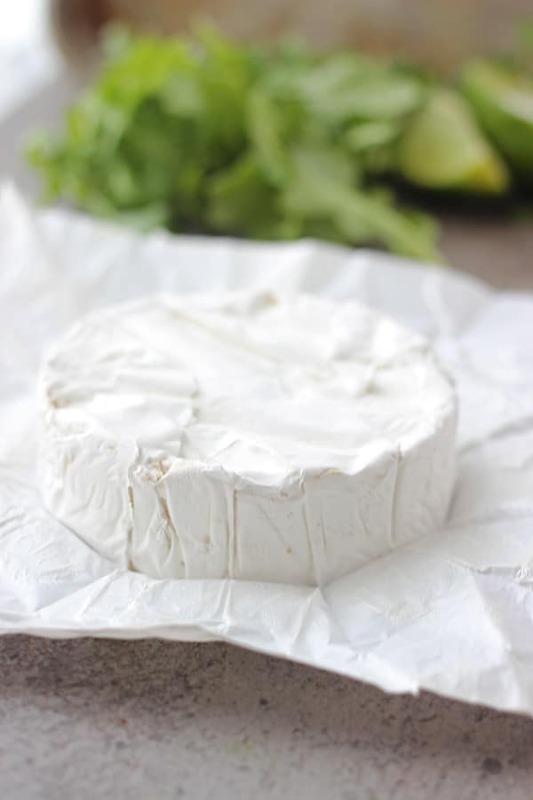 Love the brie / pear combo. I’ve never had a bison burger … I need to give it a try. And I feel you on being back to work. I had the hardest time this past week (first full week back) and I wasn’t even on an awesome vacation! Glad you survived work and hope it gets easier as the year goes on girl! 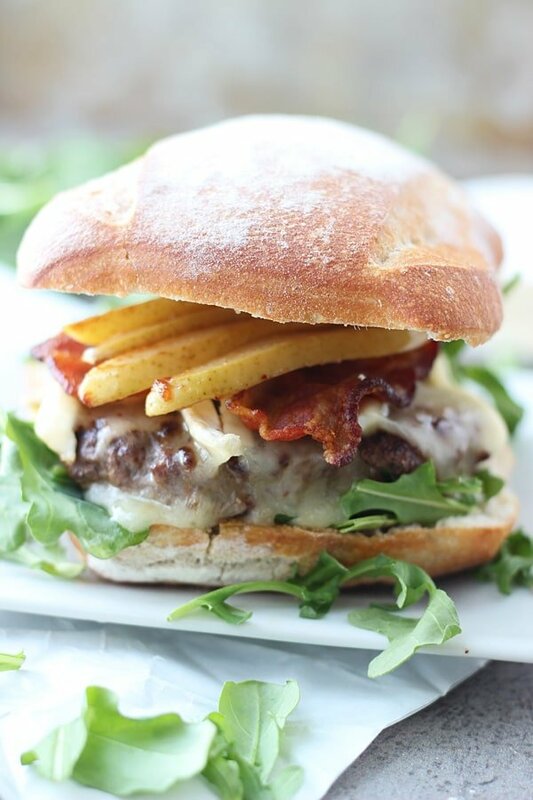 This burger, oh goodness, I usually don’t crave burgers but now it’s all I can think about! Looks amazing! OMG I’ve wanted to try bison for so long, may just have to go down this route. Can’t get it in Spain but off to UK soon for a few weeks to visit family and I know a company that delivers meats from around the world. You have to try it! So low in fat and tastes almost identical to ground beef! I’m a HUGE fan! I have a serious love of bison meat! 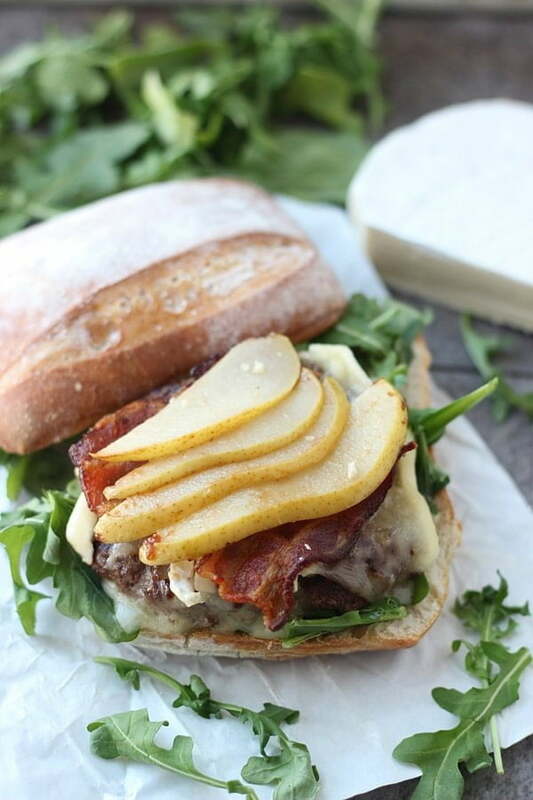 And with bacon, caramelized pears AND BRIE?! This is love between two buns and on a plate. Holy-get-in-my-face-now batman! Glad to hear you made it through work…it’s always so hard after those vacays! There is a bison farm near our cottage in Maine. When we go up for there for the summer and I start grilling, I’ll be heading to the farm for some bison to make these burgers. Ohmygosh, I would kill to have place I could get produce and meat fresh off the farm, that’s amazing! I want to try this REALLY bad. Maybe I will give it a go in the new house! Keep up the good work, it all looks fantasitic. 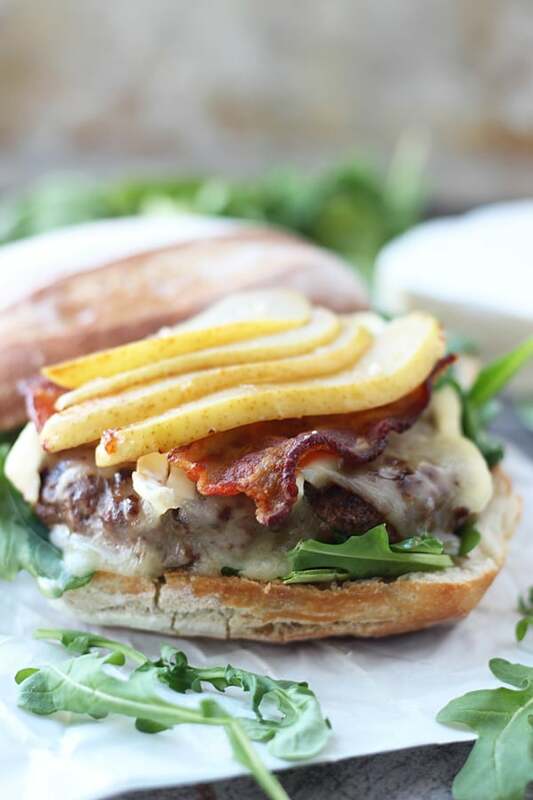 I made this burger and it was delectable–the cheese made for a velvetly bite and the pears were sweet and inviting. I can see why this would be a winter burger!